Ok, it’s story time -- A client asked me to letter a poem that was to be framed as a gift. Now this was back when I was an extreme newbie -- I excitedly whipped out my stack of quality card stock, favorite brush pen, and I went straight to work! I wrote everything out first in pencil to have the correct spacing (completely thinking that this was sufficient planning) and then I started to go over it with my brush pen. Little did I know, my spacing in between words and letters were off because of the lack of accuracy of spacing when converting pencil to brush strokes. Let’s just say that a lot of good paper was used up. Eventually, I grew weary of wasting my time and money by continuously messing up, but then I discovered the wonders of tracing paper. Tracing paper is a slightly translucent paper that allows you to see through it so that you can TRACE… hence the name ;) . I love the Strathmore 300 series Tracing Paper because it’s affordable, easily accessible at your local Michael’s, and it has a smooth surface which prevents your brush pen from fraying quickly (great for practicing your basic strokes!). 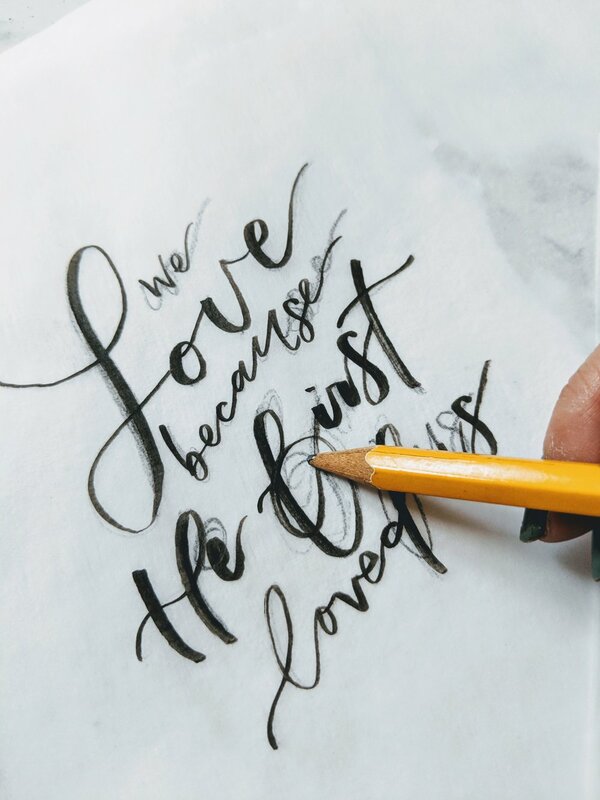 I’m going to give you behind-the-scenes look of my composition process for projects that include brush lettering quotes. I hope this helps you in your lettering journey! Sketch out a variety of layouts first to see what captures the look and feel of your piece best. You can play around with heights, fonts, angles, shapes, etc. When you lay it all out, pick the one that you like most and move on to step two! Draft 3 + 4 - Ink + Make Corrections , then Repeat! Now it’s time to see how it looks using a brush pen! Ink up your pencil draft and then take a look at your piece as a whole. Is spacing consistent? Are the rows of words lining up nicely? Mark up places where you see that adjustments are needed (spacing, thickness, shape, etc). You can make another ink rough draft by grabbing a new piece of tracing paper and tracing over it. After 1-2 times of adjustments, and when you are happy with how it looks, you can move on to the final draft! Draft 5 - Final Draft - Use a Lightbox! A light box helps you transfer your draft onto the final piece. You can place your your final piece of cardstock on top of the tracing paper and let the light box do its thing. All you have to do, is trace! Not only does this process help you with placement, but you are able to reproduce your favorite designs over and over again perfectly (if you aren’t at the digital design phase yet)!